- Psychic Power - "Jinx": Requires a successful Psychic Test, cast instead of shooting, targets any enemy unit that has at least one model within Range (24") and LOS. An affected unit must re-roll all successful 'to-hit' rolls in its following Shooting Phase. Does not affect who the Magus can charge, and if he is joined to a unit, they are not restricted to shooting/charging the same unit he targets with the power (i.e. it does not work like shooting). - Psychic Shield: The Magus has 3+ Invulnerable Save, and the Eternal Warrior USR. - Hive Beacon: All friendly units that have at least one model within 12" of the Magus may use his Ld for any Leadership tests while he is alive. If the Magus is removed from play, each friendly unit within 12" must pass an immediate Pinning Test or Go To Ground. Weapons: Lasguns/Autoguns. In addition, 1 model has a Flamer and 1 has a Heavy Stubber (R24", S4, AP6, Assault 3). - Home Turf: The unit has the Scouts and Move Through Cover USRs. 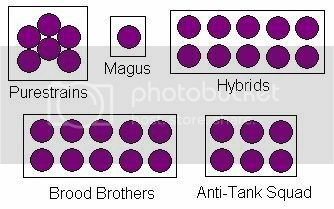 If the Magus is joined to the unit, these rules are NOT lost. Note however that units with this rule are not entitled to make Outflanking moves. Weapons: Lasguns/Autoguns, Krak Grenades. 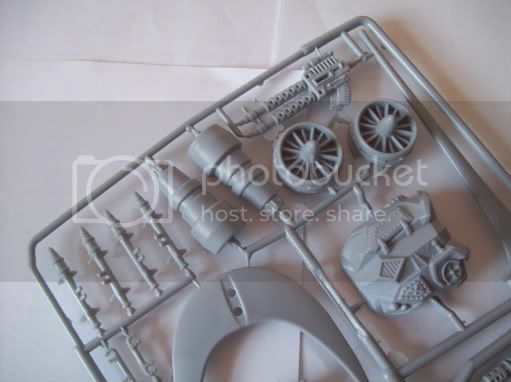 In addition, 3 models have Rocket Launchers (R24", S8, AP3, Assault 1). Weapons: Laspistols/Autopistols, Close Combat Weapons, Frag Grenades. In addition, 5 models have Rending Claws. - Hidden Threat: The Purestrain Brood MUST be placed in Reserve during Deployment, and enter play using the Deep Strike rules. Once they arrive, they receive a 5+ Cover Save (which can be improved by Going To Ground as normal), even in the open, until the start of the following Cult turn. This Cover Save is immediately lost if the brood decides to Run in its Shooting Phase. Last edited by LordMalekTheRedKnight on Fri Jul 25, 2008 2:40 pm, edited 1 time in total. The hybrid brood will get hurt by complex units a fair bit now.. maybe they need to be put through the dark eldar wych process of abstraction for their claws? Is it desinged to be used in anyway above 400? nope : 400 pts exactly, and what you see in the list is all they get. killmaimburn wrote: if it is meant for (proper ) 40k I would let them outflank..
the idea was they would know of shortcuts, secret passages and escape tunnels, and might be able to advance closer disguised as civilians. a 6" move suits that fine, IMO. if i was planning on using it in bigger games, i would probably have used the BoLS list. well they still have one unit of DS'ers, and another unit with Fleet. half the force only needs to be within 24" to be effective, and can move and shoot as well. besides, we still havent decided whether we are going to use the full array of missions i CP (might just be Annihilation). killmaimburn wrote: The hybrid brood will get hurt by complex units a fair bit now.. maybe they need to be put through the dark eldar wych process of abstraction for their claws? i was thinking of Harlies when i wrote that (the idea being that some Eldar players recommend only giving Kisses to part of the unit, in order to keep some models cheap as they will lose a few on the way in). it was better than giving the whole unit Rending, or fielding a smaller unit. i like the mix of different generations of hybrid, too. even if the non-claw models are in the minority, you can still allocate wounds to them first, right? im not too worried about it. I'm playing you at 400 cp anyway, I'm bringing the cult, so I play you with my figs, your list??? Will temporarily (re)swap delaque heavy lasgun for a stubber. I am missing 3 hybrids with pistol (the 2 I have done have bolt pistols, though we can ignore that), rending claws and/or ccw. If you slapped an undercoat onyour 3, or whatever is minimum requirement, we're away!!! ruffian4 wrote: How about this Tim. ruffian4 wrote: If you slapped an undercoat onyour 3, or whatever is minimum requirement, we're away!!! i havent even chosen arms for mine yet, so they are well away from being undercoated (and the 2 that dont need arms still need stripping :oops:). we could however use a few 'Stealers to proxy for Clawed Hybrids, right? its not like it would get confusing, as the proper (painted) 'Stealers would be in a totally separate unit (plus the Rending Claws are WYSIWYG). Ok, I have access to 36 stealers from hive fleet brawn (painted up). I could bring 3 of them too??? If so, for christ's sake remind me before hand (goldfish attention span). 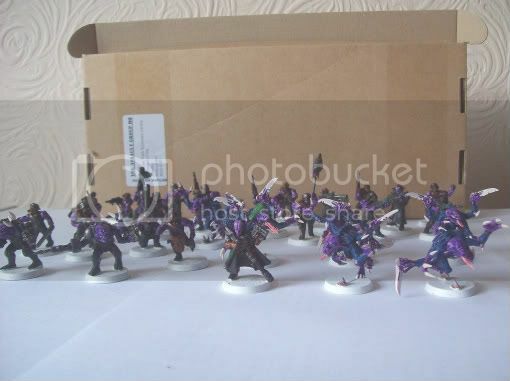 ruffian4 wrote: Ok, I have access to 36 stealers from hive fleet brawn (painted up). I could bring 3 of them too??? ruffian4 wrote: If so, for christ's sake remind me before hand (goldfish attention span). p.s. any questions about using the Cult list, just post them here or PM me. Last edited by LordMalekTheRedKnight on Fri Jul 25, 2008 4:42 pm, edited 1 time in total. its an extra arm, but no extra attacks: they get the bonus for CCW + Pistol like the rest of the squad, but on top of that their attacks are Rending. on the tabletop, the non-claw models will all only have 2 arms, and the clawed ones will have 3-4 inc. a Genestealer style Rending Claw. Last edited by LordMalekTheRedKnight on Fri Jul 25, 2008 4:53 pm, edited 1 time in total. hmm, tempting... could you put a Guardsman next to one for scale? Kind of like a slightly large rpg. cheers mate - they look about right actually. 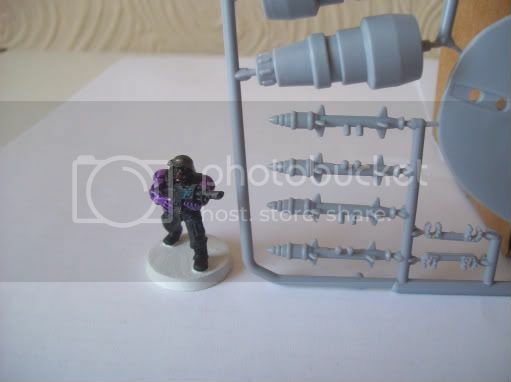 although i would probably want to use them as inspiration to scratchbuild my own (ive got various thicknesses of plastic pipe, rods and sheets, and i could use greenstuff for the cone) rather than stray from my "GW only" mantra (:roll:). EDIT: my latest recruit has arrived! i now need just 2 more OOP models (non-clawed Hybrids). Last edited by LordMalekTheRedKnight on Fri Aug 01, 2008 12:40 pm, edited 1 time in total.